Well, to say it's been a while since I've posted would be an understatement! Although I haven't posted a new update here, I've been busy sharing ideas on Instagram and Facebook. I am also constantly updating old blog posts as well! Did you know that I don't typically create a new blog post on a topic I already have a post about? Instead, I add to it so that all of the information is in one place! Enough about my lack of an update... It's TIME for an update! Test prep season is upon us, and for many, testing season has already arrived. Last year, I created my Reading Skill of the Day resource with the intention of it being used during the second half of the year as a test prep of sorts. It became very popular quickly and before I knew it, people were requesting a second set of them because they used the first set during the first semester! I recently released the second set to go along with it, and now I'm releasing a brand new FREE resource chock full of information that will accompany it! 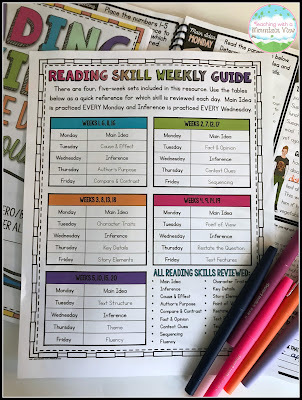 Now, even if you don't use the Reading Skill of the Day, this Quick Reference Guide is still an INCREDIBLY valuable, must-have resource for your classroom. It gives your students access to quick reminders about so many reading skills, right at their fingertips. 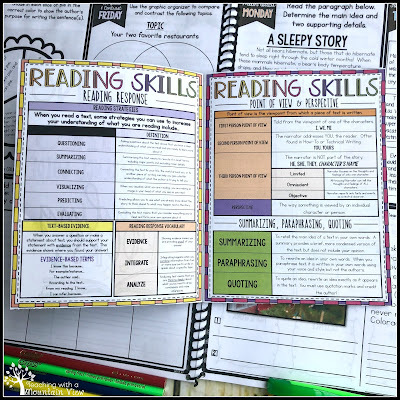 Students learn so many different reading skills throughout the year that it can quickly become overwhelming for them to remember each of the skills. I wanted to create a quick reference guide for reading skills (I already have a FREE one for language skills!) 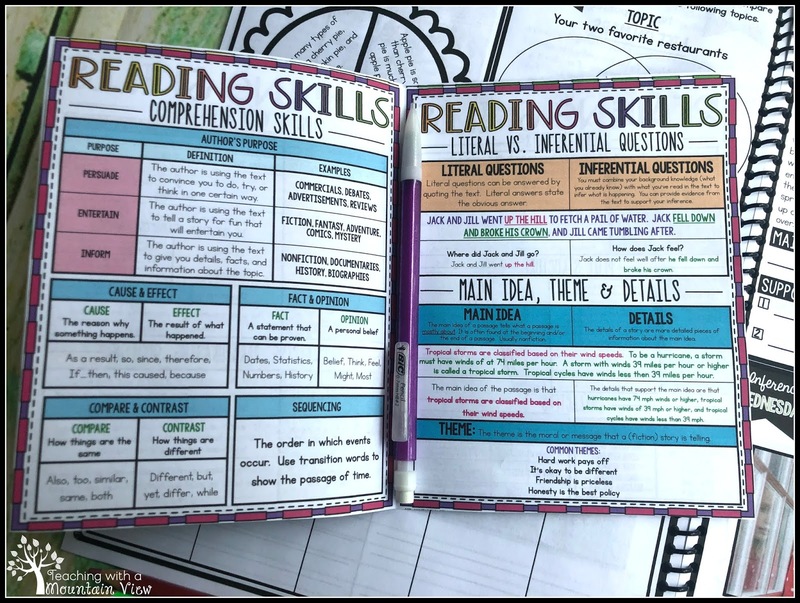 so that students could put it into their reading notebooks or keep it handy during close reading. 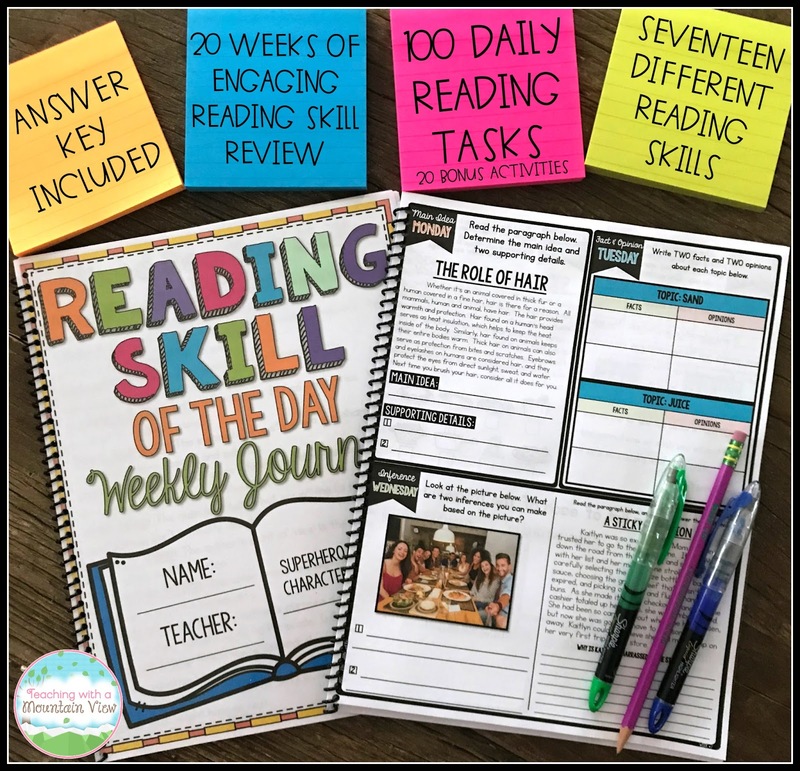 Their close reading kits are used for ALL kinds of reading, not just their Reading Skill of the Day work. 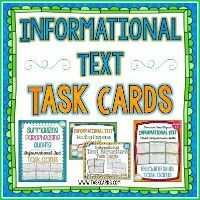 They can be used when you are doing a close read as a small group or whole group, when they are in novel groups, etc. 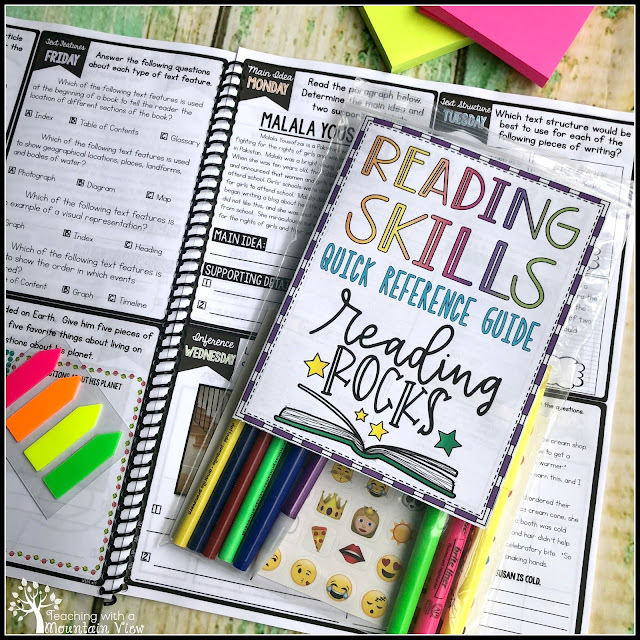 Inside, they have everything they need for annotating and responding to text (including their handy quick reference guide)! 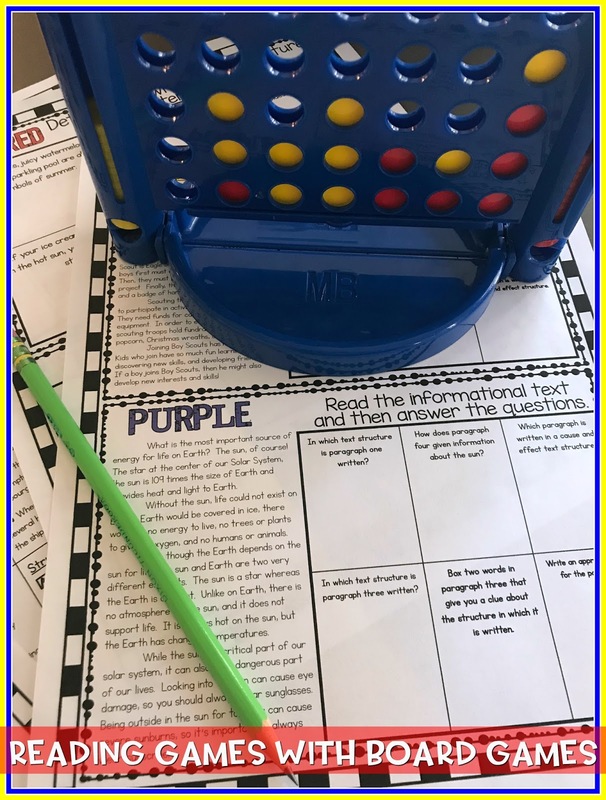 I have also found that these kits come in handy with my newest resource, Rapid Read and Respond, as there are several opportunities for students to use colors. Inside of the close read kit, I include some sticky note arrows, some emoji stickers for responding to text, primary color (plus green) colored pencils, highlighters, a Flair Pen (see note below! ), and a mechanical pencil. Most of these items come straight from student supplies at the beginning of the year, but here are all of the Amazon Affiliate links to the specific items I put in the bags. I searched high and low to find the least expensive option that was sturdy enough for everything (including pencils that may poke through the bottom) AND fit the reference guide. These are perfection! I decided to try these since they are SO much less expensive, and they're great! Kids love them. I like these because you can see through them and use them as highlighters, too! Plus, there are 30 separate packs, which is perfect for a classroom. Basic, but Amazon has a really great price for them. 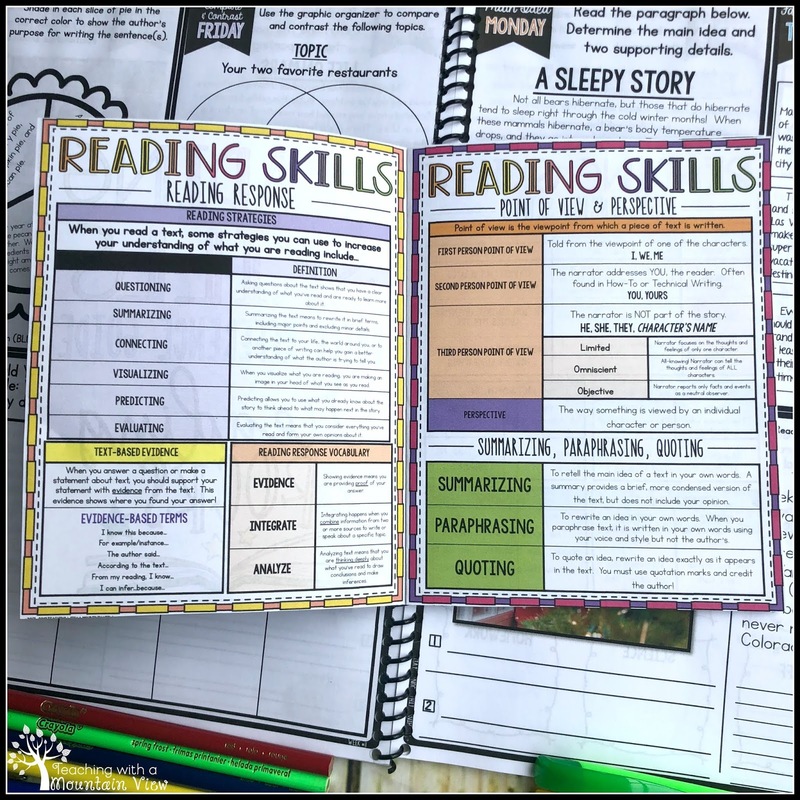 Here is a closer look inside of the Reading Skills Quick Reference Guide and more information on how you can grab yours for FREE! 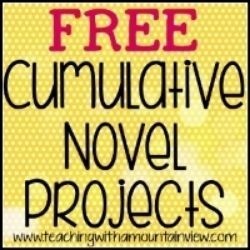 I hope you absolutely love this free resource! To get yours for free, simply enter your email address and click "Get it now!" to subscribe to my newsletter (don't worry... I will never spam you!). Then check your email for your FREE Quick Reference Guide. 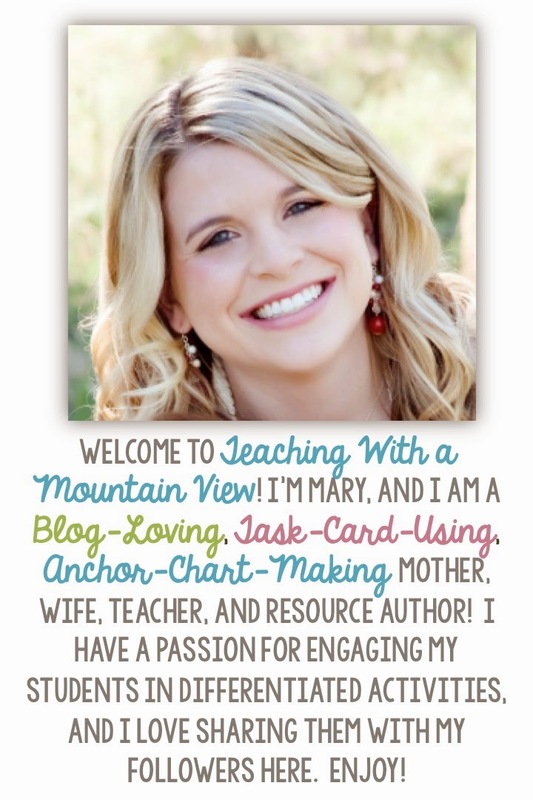 I'll be back soon with a fun blog post with videos you can use in your classroom to engage your students! Happy Spring. There will be SIX big winners with this giveaway! 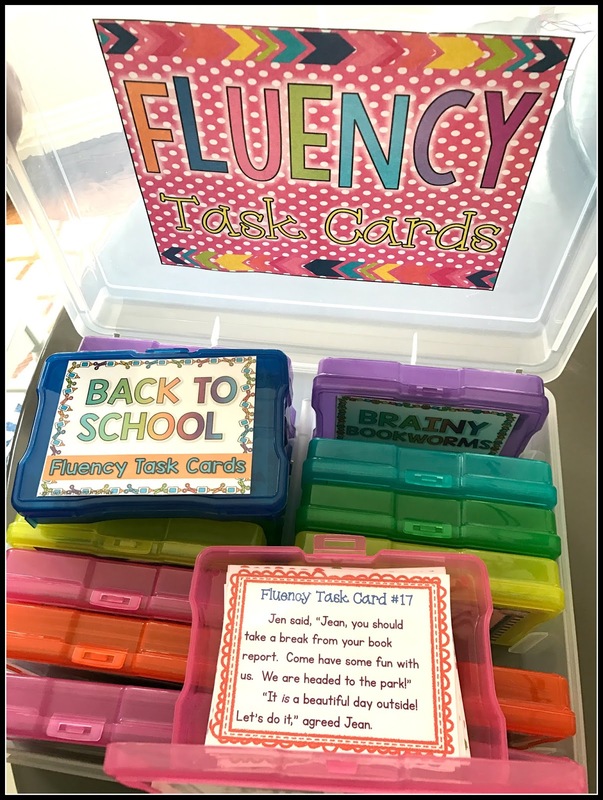 A FULL task card storage box filled with all sixteen sets of my Fluency Task Cards printed in full color and laminated. A Teacher Care Package with "essential" teacher school supplies. 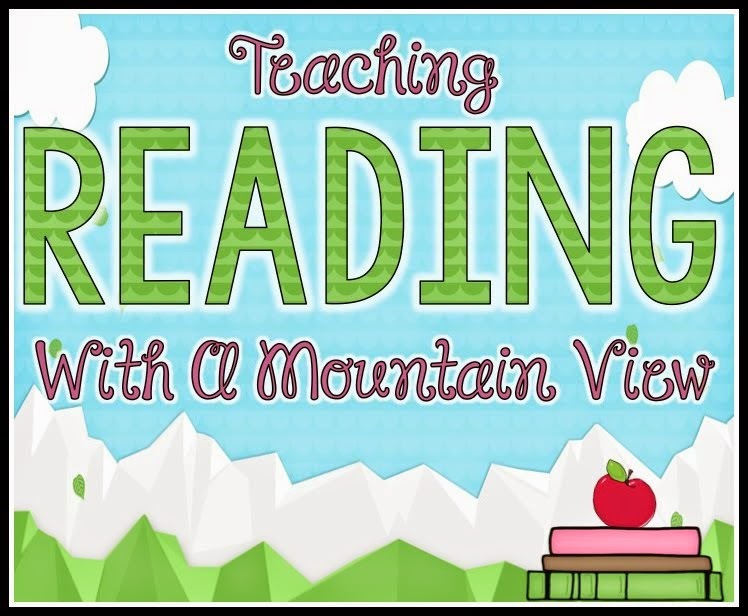 A Teaching With a Mountain View flash drive filled with over $150 worth of digital resources from Teaching With a Mountain View. 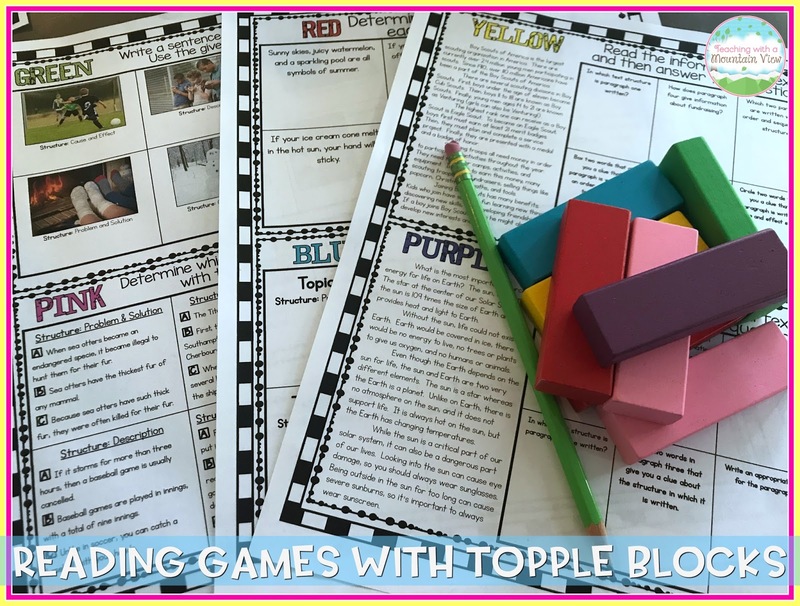 I'm popping in with a quick post to share a few new ways to use my Reading Games for reading comprehension review! I get a ton of questions about different ways to play this game, so here are a few ideas! I originally designed these games to be used with Jenga-style topple blocks, but I wanted to give teachers other options just in case they didn't have topple blocks, if they wanted to change the game up a little bit, or if they wanted a quicker version of the game. 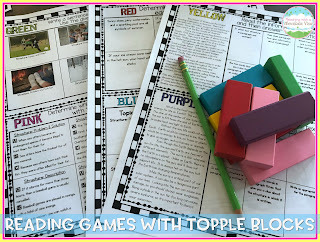 I have blogged about using topple blocks as math games HERE and HERE. 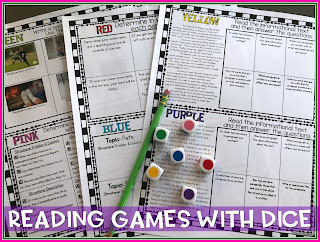 For each of these game play samples, I used my Text Structures Reading Game! The easiest way to play and have kids complete ALL of the questions is using the points tracker. I like to incentivize this a little bit and use it as more of a "time tracker." 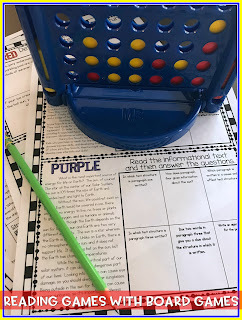 Students get points for each of the questions they answer correctly, and then at the end, the number of points they have is the amount of time they have to complete some sort of STEM challenge. Kids LOVE this, and it only takes an extra 5-10 minutes at the end of the game! Have some extra board games laying around? This is another easy way to use the game. I have my students complete one question (of their choice) each time it's their turn to make a move. I make BOTH students who are playing the game answer the same question at the same time so that there is never really any down time. They check their answer using the answer key and get to make the move if they get the answer correct. The board game above is a mini version of Connect Four that I purchased for $5 at Staples. This is the "original" inspiration for the design of the game, and kids LOVE it! I purchase my block sets on Amazon HERE. 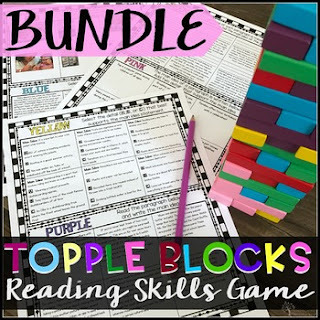 (Affiliate Link) The sets include a multi-colored dice that the students roll, and it tells them which colored block they need to pull from the tower. Before they can pull their block, everyone on the team answers a question with the corresponding color. 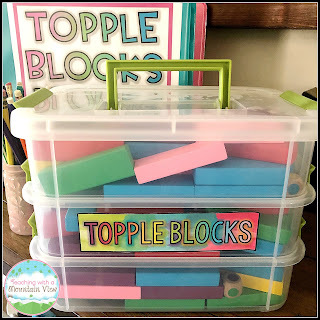 This is a super inexpensive alternative to the Topple Blocks, and kids still love it! I purchase these colored dice on Amazon HERE. 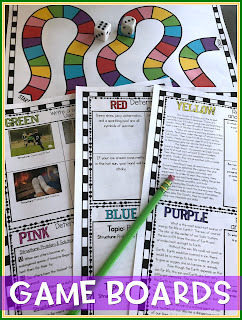 (Affiliate Link) Then, they roll the dice to see which color question they complete. Simple as that! 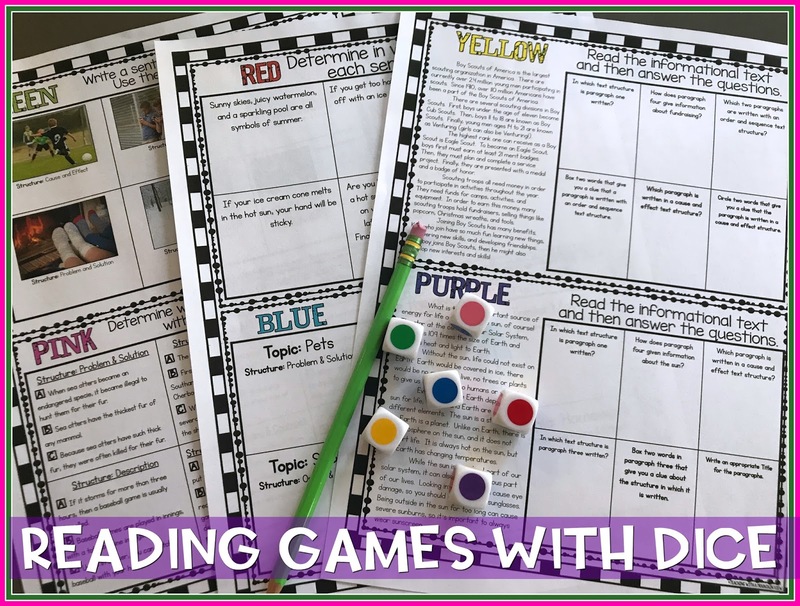 Finally, I created these FREE game board options to use with the reading games! There are multiple options for using the game boards that make them all super engaging! 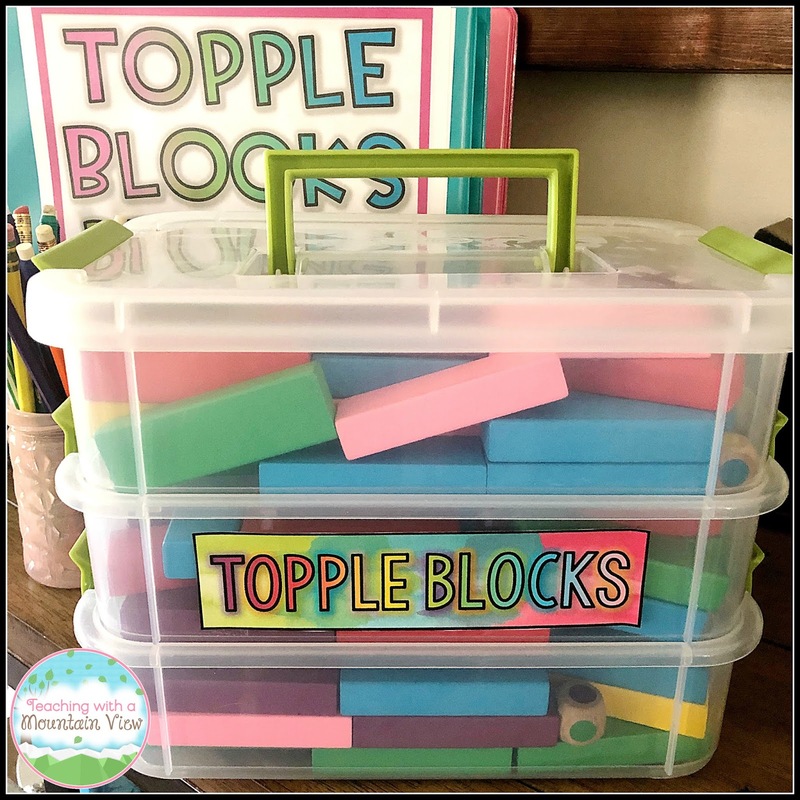 I also get quite a few questions about how I store all of my blocks. They come in a box that isn't incredibly sturdy, so I searched high and low for a good storage solution! I tried many different options and finally settled on these three tiered Sterilite Snap & Carry bins. They have them at Target and Wal Mart, but they are only $6 at Wal Mart, so that's definitely where I suggest grabbing them! Click the image below to check out all of the different versions of the game I have! Happy playing! I don't know about you, but I absolutely love coming back to my classroom in January. By this point in the year, our routines are solid, and it is a great time to really dig in to content. 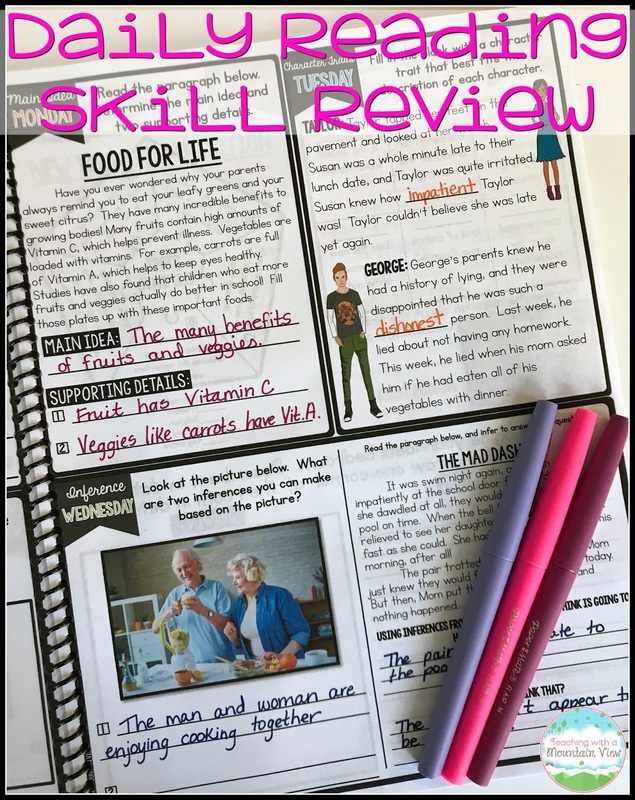 Even though second semester is always full of novel study, I still find that my students need a bit of review about all those different skills that we have worked on, especially with state testing coming up. 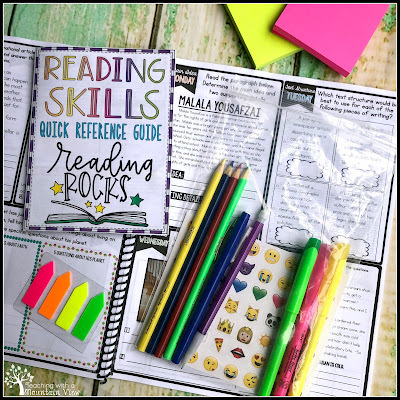 I have blogged many times before about how I review reading comprehension, and I'll link to those posts at the bottom of this post. But today, I have a couple of new ideas for you! 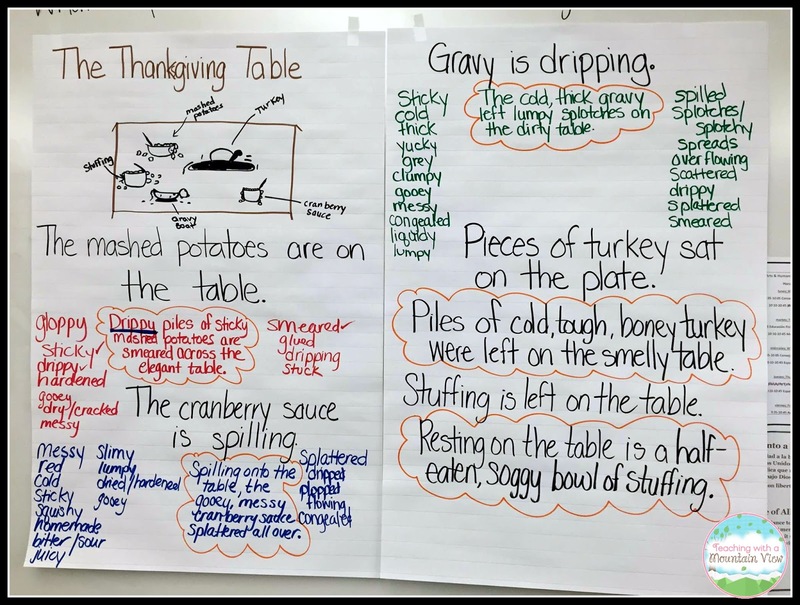 While I explicitly teach all of our reading skills and we review them at length, there is something to be said about the students knowing exactly what each of the reading skills is asking them to do. 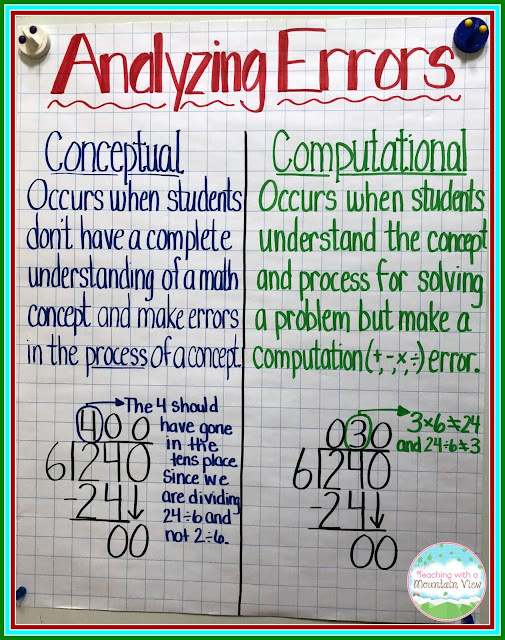 I cringe when I see students struggling on tests because they can't remember the difference between a text feature and text structure or what exactly they are looking for when prompted for a theme vs. a main idea. 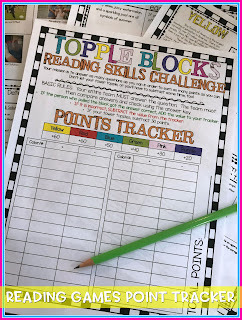 This year, I created a fun review activity to help my students revisit all of the different reading skills. With this little game, the students have to find the definition for the reading skill AND match the key word/examples to the reading skill. 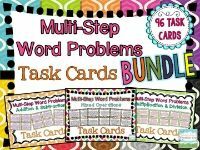 It's a fun, quick way to review all of these different ideas with students! 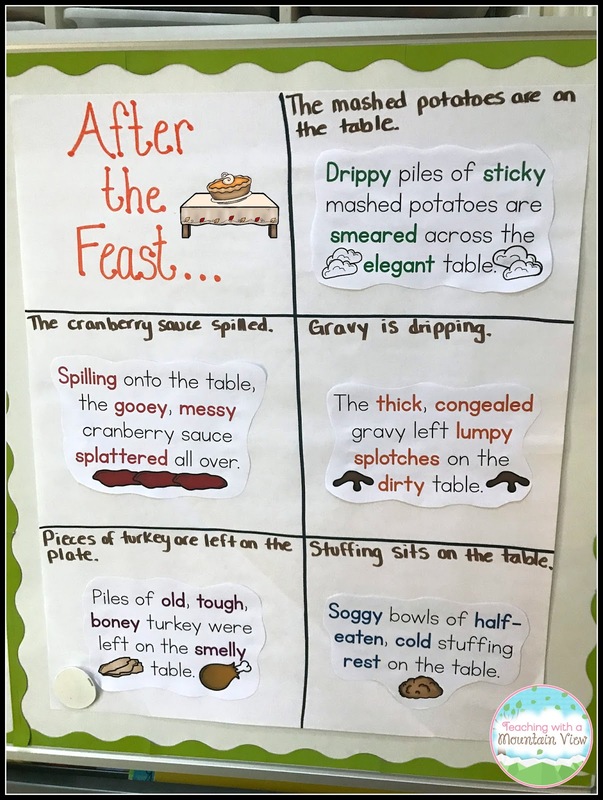 I like to use this type of activity in a small group setting so that we can discuss the different definitions and key words. I printed the two boards out and laminated them so that I could use them with multiple groups. Then, I printed the definitions on one color and the Key Word/Samples on another color. I cut velcro squares in half and put them on the boards and the backs of the definition/samples. Super easy! You can grab your FREE sort by signing up for my newsletter below. If you already subscribe to my newsletter, enter your email address, and you'll receive the freebie in your inbox! 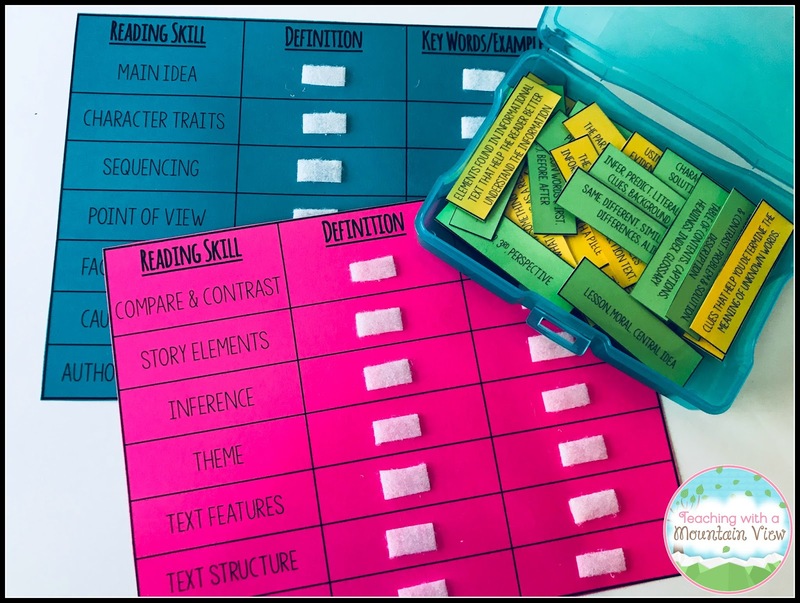 Get your FREE Reading Skills Sort! Subscribe to my newsletter (No Spam. Ever.) and immediately receive your FREE copy of my Reading Skills Sort. Year after year, I have searched and searched for a great way to incorporate a daily review of all of these skills. I never found anything that fit the bill and was super engaging for my students. Most of what I found looked the same as what I already had-- long passages followed by multiple choice questions or open-ended answers. So, I decided to create it this year, and I'm so tickled with how it came out!! 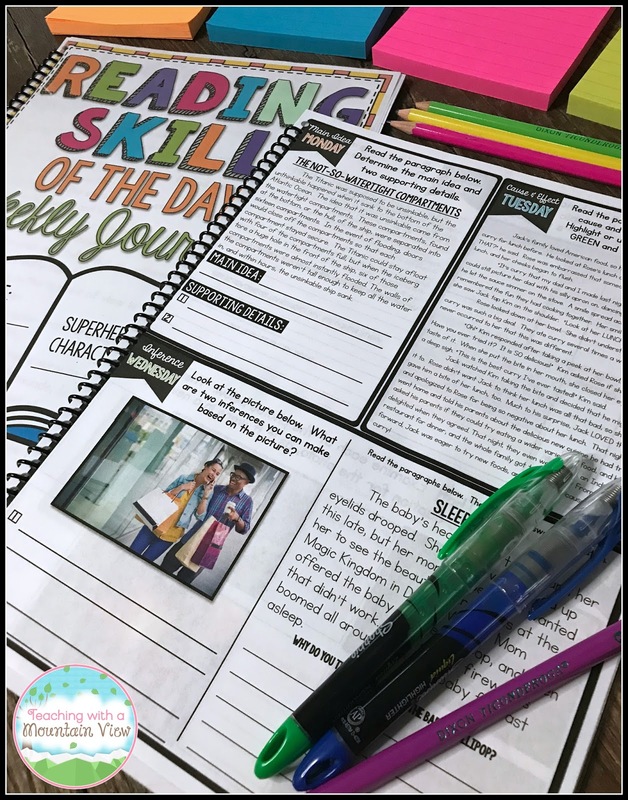 Introducing... the Reading Skill of the Day Weekly Journal! 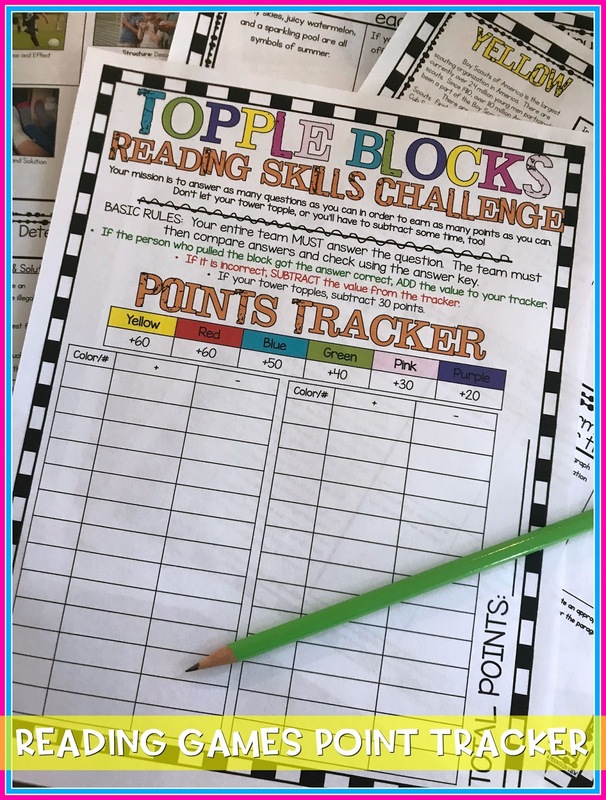 I began by looking at all of the different reading skills I needed to incorporate... I knew that Main Idea and Inference were skills that I wanted to cover every single week, so Main Idea Monday and Inference Wednesday were born! The rest of the skills (and the sequence in which they appear in the resource) can be seen in the calendar below. Each week covers a new skill in a fun and engaging way for students. 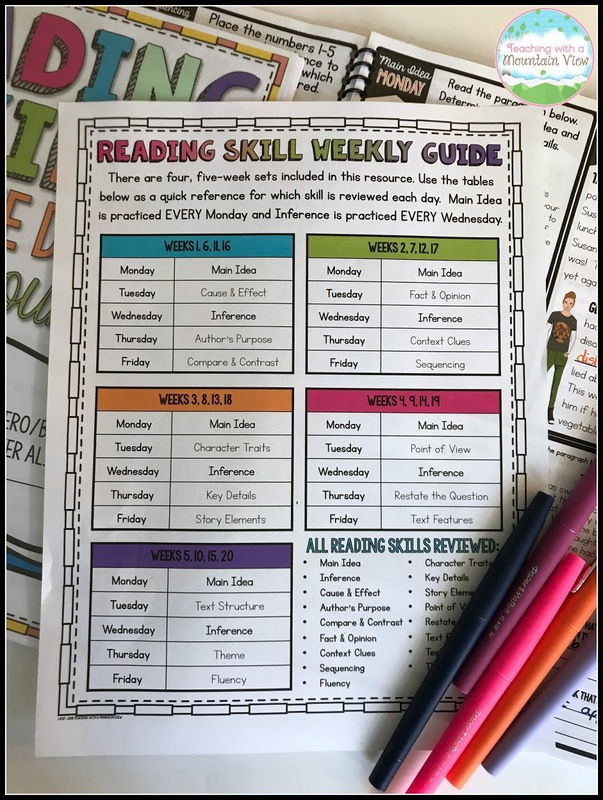 The variation in skill practice allows them to see the skills differently and get oodles of valuable reading practice. 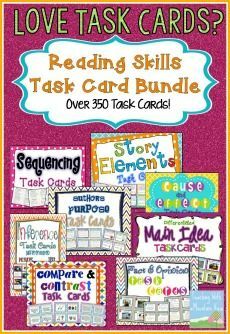 Best of all, almost all of the tasks can be completed in five minutes or less, making this a super easy resource to incorporate into your literacy block. 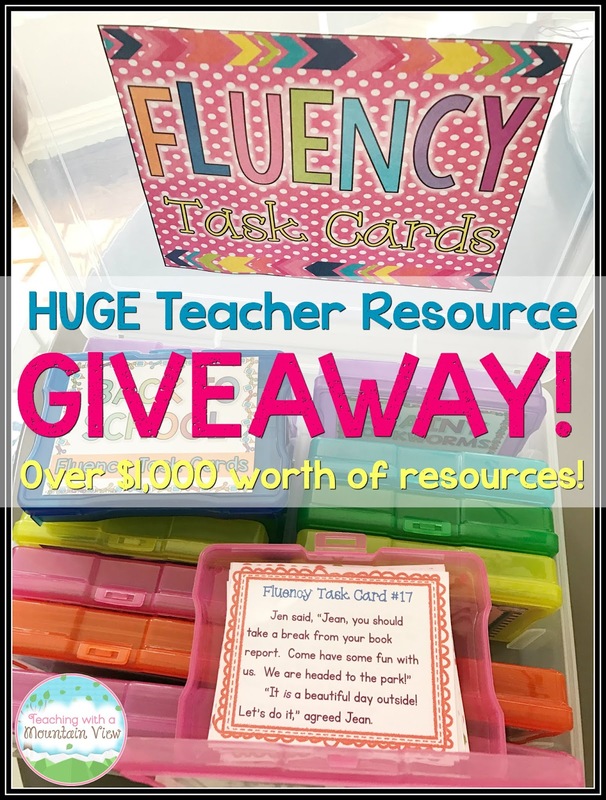 Each week also includes a bonus activity for your early finishers and as another learning engagement to keep your kiddos excited about reading! 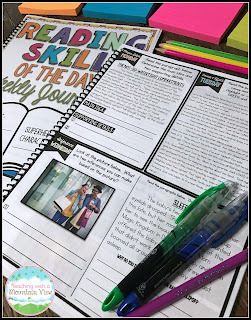 If you'd like to see even more about this journal, please visit my Teachers Pay Teachers store by clicking HERE! 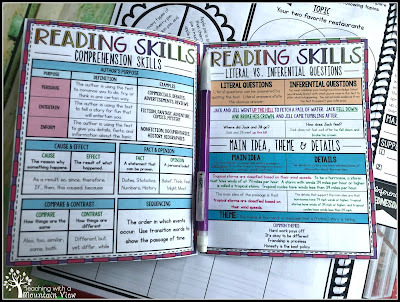 Are you looking for even more creative ways to review reading skills? 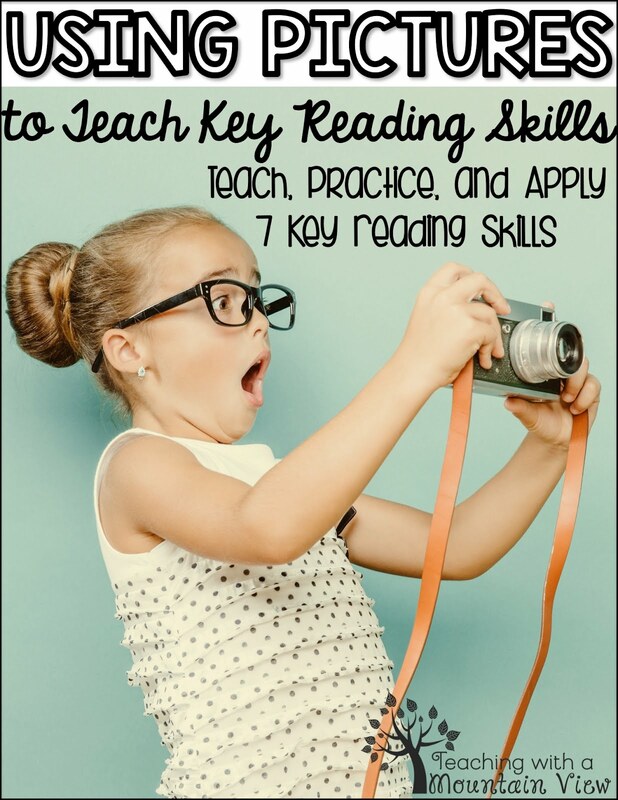 Using Pictures to Teach Reading Skills is the perfect companion to Reading Skill of the Day! 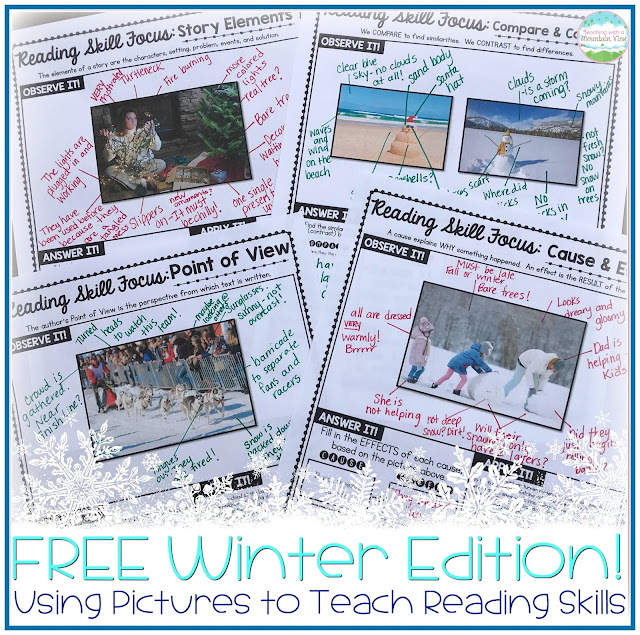 Try out my FREE winter-themed version (which can be used any time of year) of Using Pictures to Teach Reading Skills! 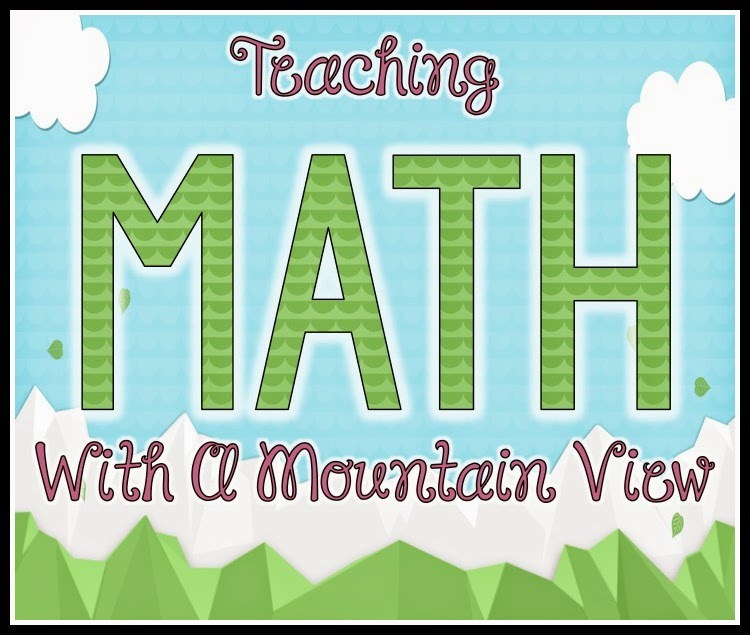 You can get this for FREE when you subscribe to my Teaching With a Mountain View Newsletter! This is a newsletter subscriber EXCLUSIVE freebie and you can't access this content anywhere else! It's easy, and I promise to never send you any spam! Sign up below and you will immediately receive an email with your freebie! Just enter your name and email address and click, "Get my Freebie!" FREE Winter Edition of Using Pictures! Enter your email address below to subscribe to my newsletter. You will automatically receive this free resource in your inbox! Success! Now check your email to confirm your subscription and grab your free resource! I know the feeling. The holidays are coming! You want to keep things fun and festive, but you also have to keep things rigorous and academic. 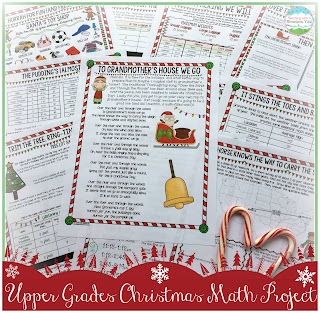 Finding the perfect balance can be tough, so I've compiled ten of my favorite academic yet incredibly festive and engaging activities to get you through the next two weeks! 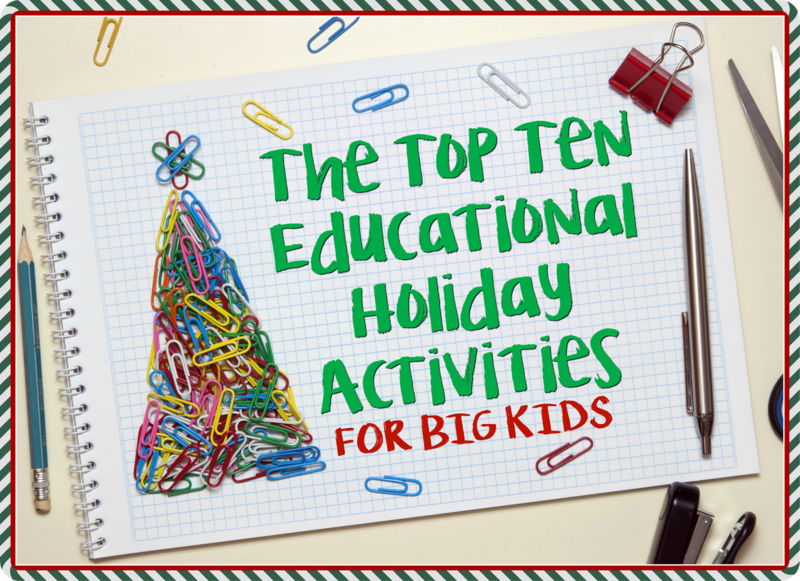 I've blogged about great holiday activities before HERE, but this is a new compilation! This list contains a variety of my own activities as well as some other activities from some of my very favorite teacher authors! Do you have a favorite holiday activity? Be sure to share it in the comments! If you have never tried this writing assignment, it's a MUST DO! 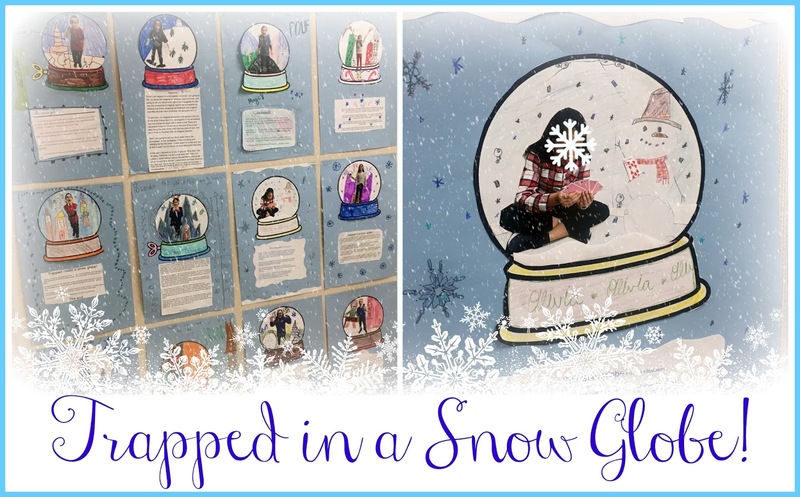 The premise is simple: your students have become trapped in a snow globe, and their writing must detail their adventures while they are inside. 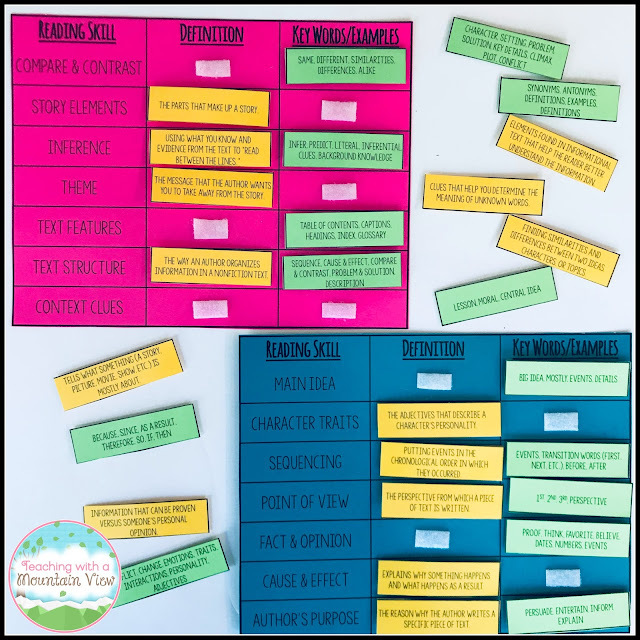 I used THIS freebie to help my students plan their writing. Then, I took pictures of them to place inside of their snow globe and decorate. This is always such a huge hit. This freebie includes SEVEN pages of winter reading tasks using pictures! 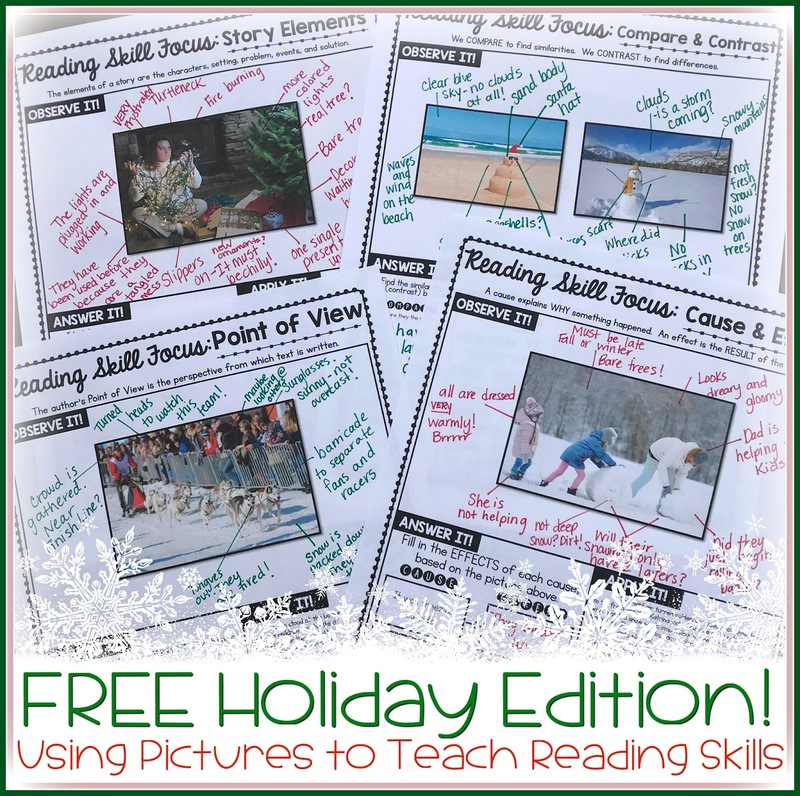 This was inspired from my best-selling resource, Using Pictures to Teach Reading Skills, and I decided to make this little freebie to get your students into the holiday spirit! 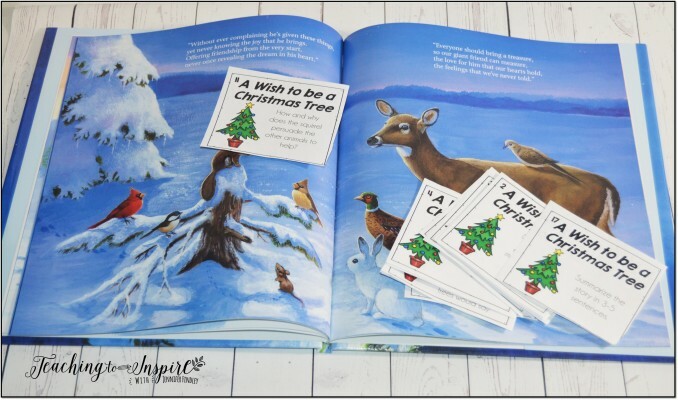 Whether you have used the original version in your classroom or this is your first time using pictures to teach reading skills, your students are going to LOVE these pictures and accompanying activities! FREE Holiday Edition of Using Pictures! 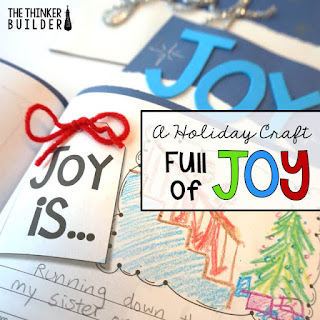 This post has a TREASURE trove of literacy activities to accompany beloved holiday picture books. 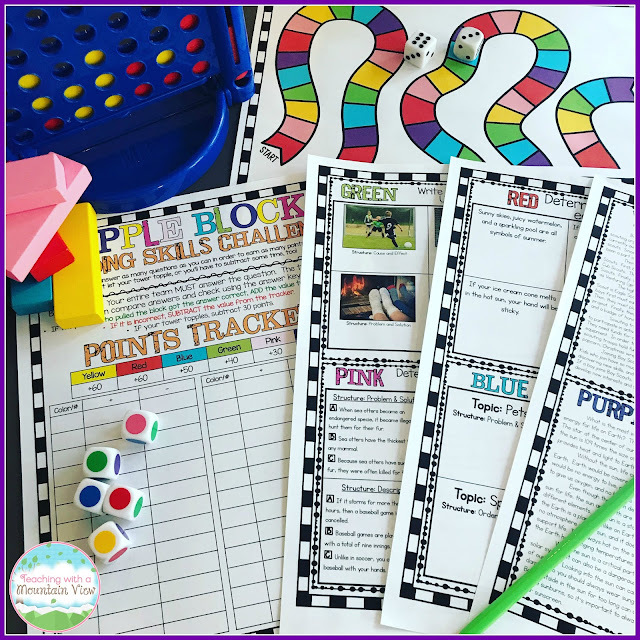 Jennifer from Teaching to Inspire has created printable activities to go with each book she features, and each activity is rigorous AND engaging! 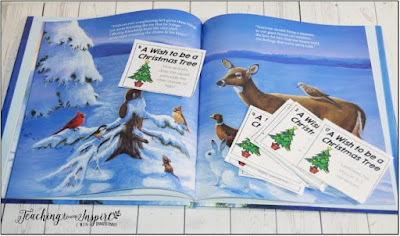 Download all of the free Christmas book activities HERE. It somehow always happens that I am teaching division right before Christmas break. (You can read more about that HERE.) This is hard. Really, really hard. I am always trying to find highly engaged activities to practice division, which isn't always easy. 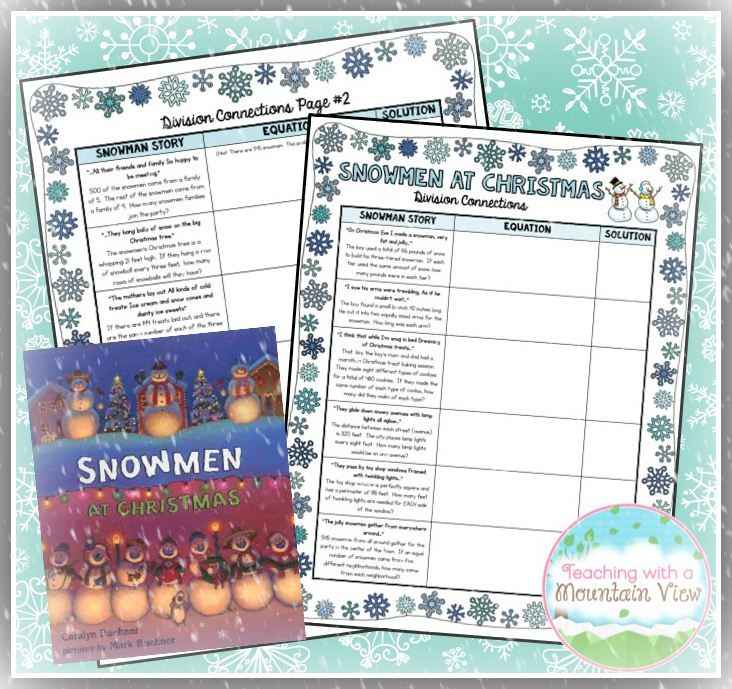 A few years ago, I created this division companion to Snowmen at Christmas, and my students just adore it! We read the book, and then they complete the tasks that go with it. You can download the Snowmen at Christmas Division Freebie HERE! 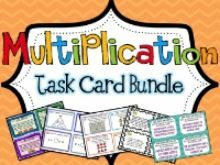 These two are also math activities, and they cover multiplication and division! I started creating math pictures with place value, and my students totally eat them up! For these math picture, students use numbers in their life to come up with an answer. Then, they use their answer to draw the picture. The answer might tell them how many trees they have, how many peaks their gingerbread house has, etc. I love these pictures because they all come out differently, and the students are still completely engaged in the math aspect of it! 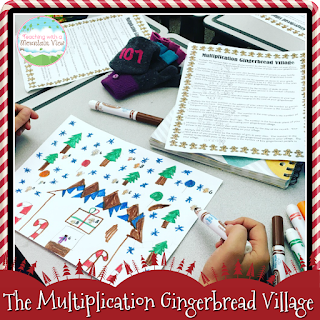 Download the FREE Multiplication Gingerbread Village HERE. Download the FREE Division Tree HERE. 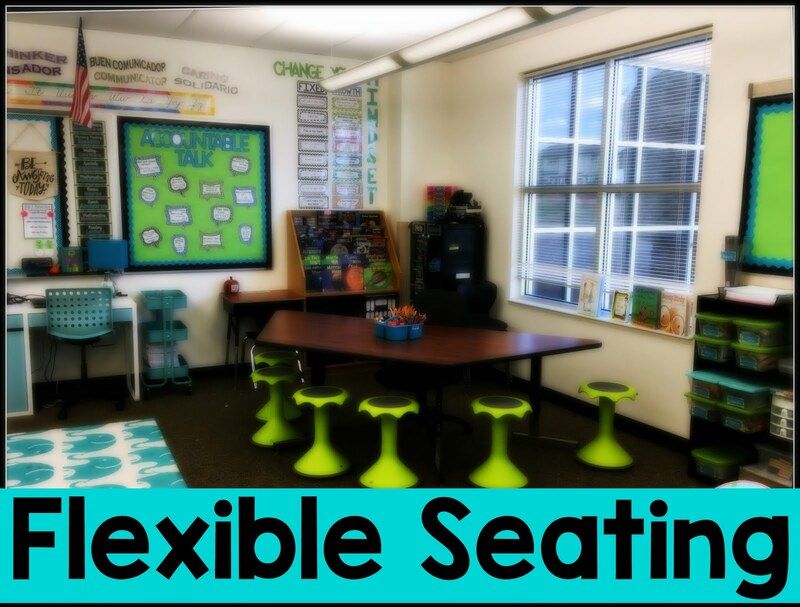 Stephanie from Teaching in Room 6 is one of my absolute favorite teacher bloggers because the activities she shares are always SO academically focused while still being fun! 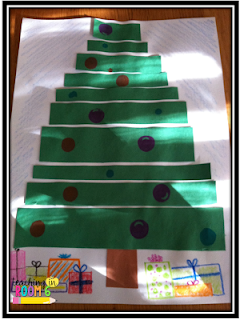 Just look at how sweet these perimeter and area trees are! If you have older students, this is a great review for them, and if you have younger students just learning about area and perimeter, it's great practice. Download the FREE Tree recording sheet HERE. 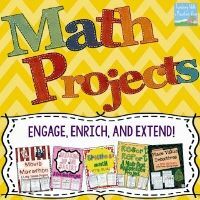 My students always look forward to math projects, and this one is no exception! Students review a plethora of different math skills with this project while planning a trip to grandmother's house. 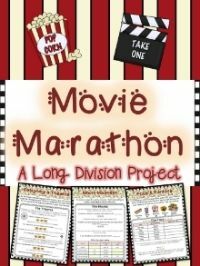 This is a multi-day project, and it is great for the days leading up to break because it reviews so many math skills and keeps kids super engaged. Grab To Grandmother's House we go HERE. 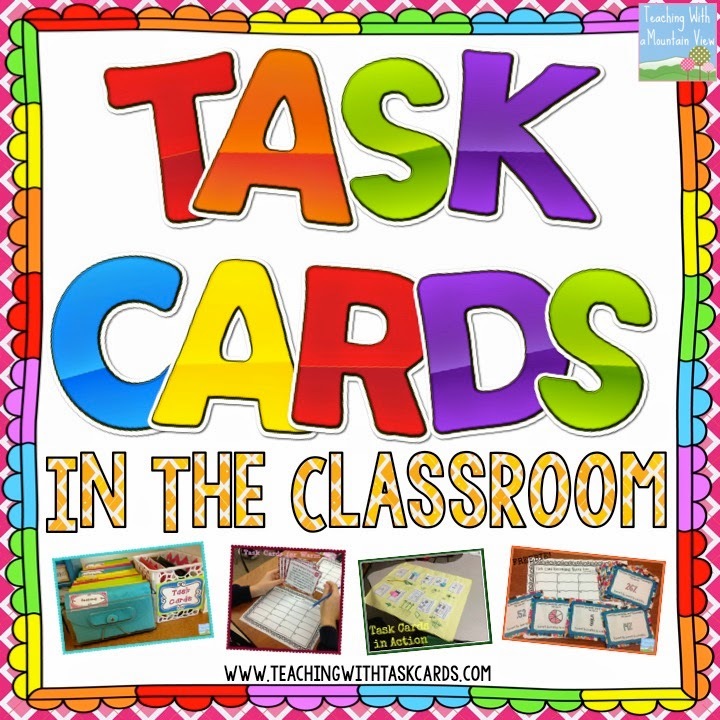 I created these FREE task cards to make it really easy for you to adapt them to use! 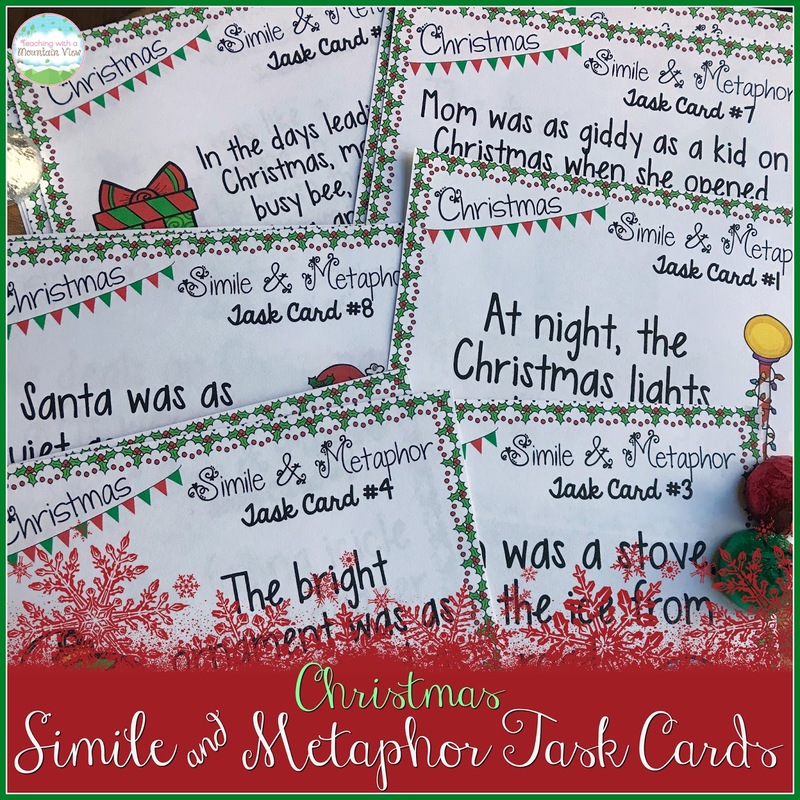 There are 32 simile and metaphor task cards with a holiday theme! You can use a few a day, do a scavenger hunt, etc. 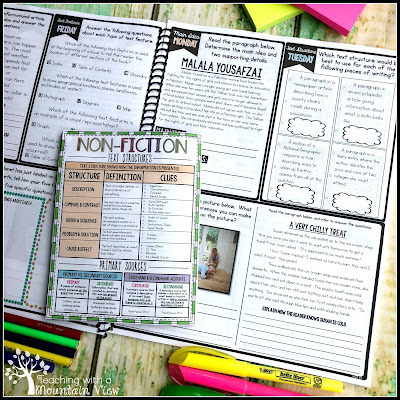 The possibilities are endless, and now is a great time to review figurative language skills! 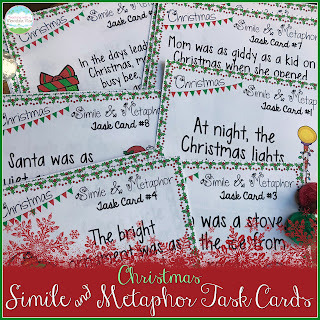 Download the FREE Christmas Simile and Metaphor Task Cards HERE. There isn't much that engages my kids like a good STEM activity! Ari from The Science Penguin has created some of THE COOLEST Christmas science activities I've ever seen. I love that Ari always creates resources that don't require an excess number of supplies, and you can implement them right away. 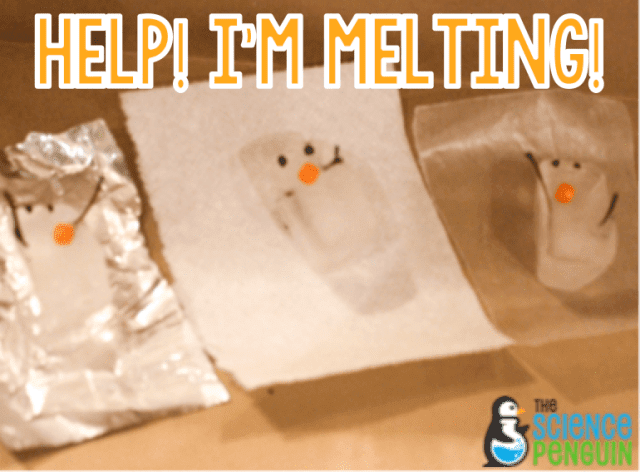 See all of her Christmas Science Labs HERE! 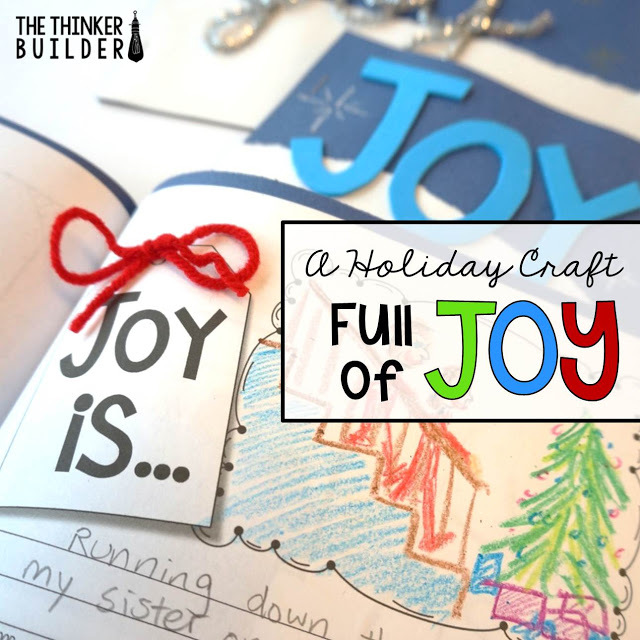 This activity from Michael at The Thinker Builder is both educational AND artsy, and it's the perfect holiday gift for parents. 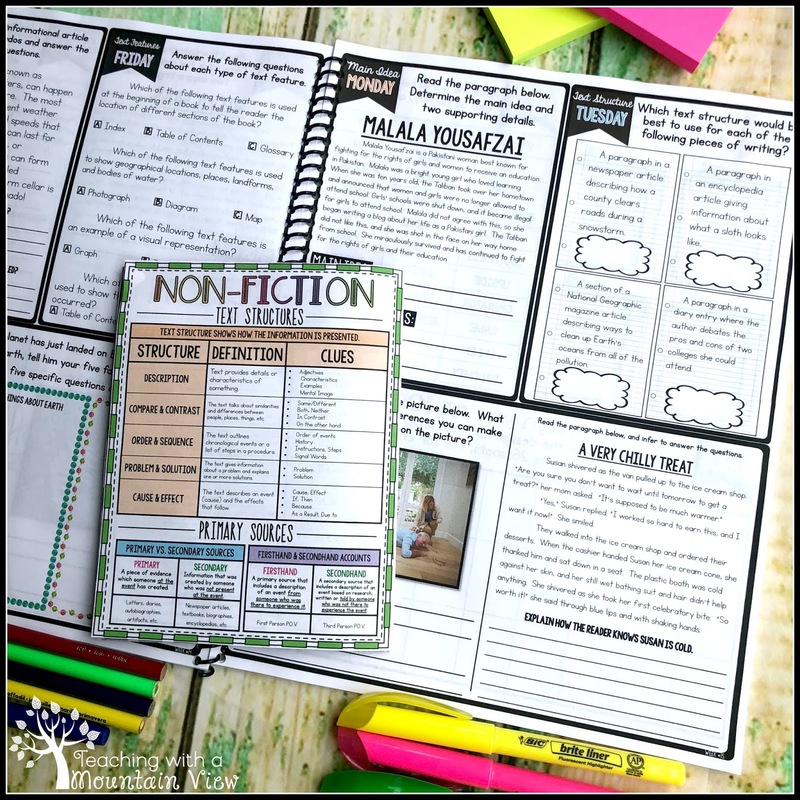 Grab the book that Michael suggests and download his freebies, and you will be well on your way to a fantastic holiday activity! Learn more and Download the FREE activity for HERE! 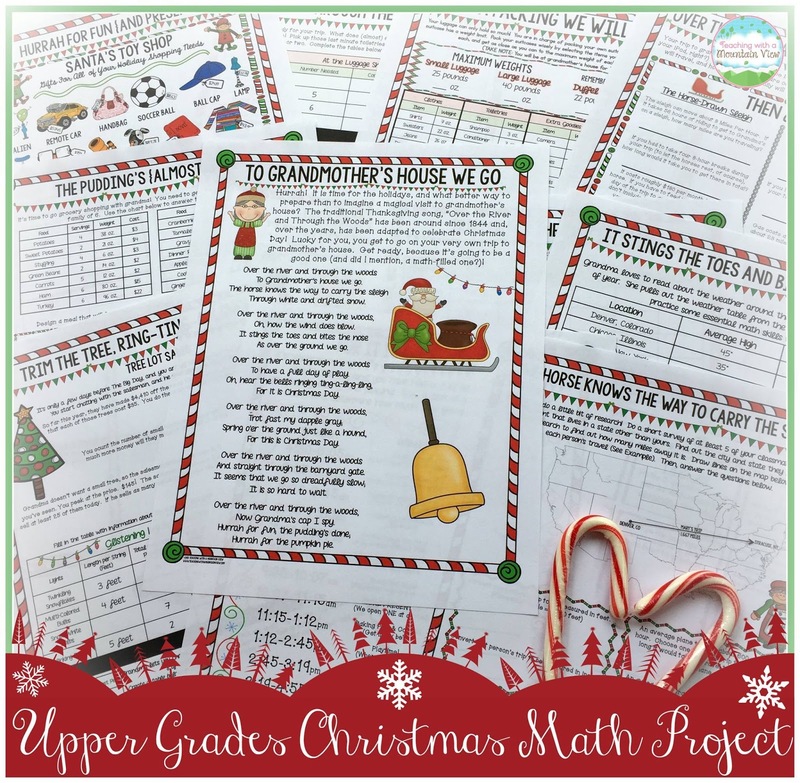 If you are looking for even more holiday activities that have a HUGE educational bang for their buck, I have a bundle of all of my Christmas resources. It is guaranteed to get you through those long days before break! 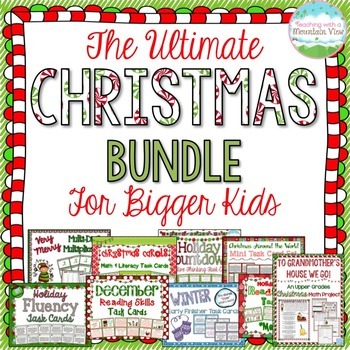 Grab the Christmas bundle HERE. Hi there! Can you believe there is only a week until Thanksgiving!? I am in total disbelief that it's already November 14th... Time sure does fly. 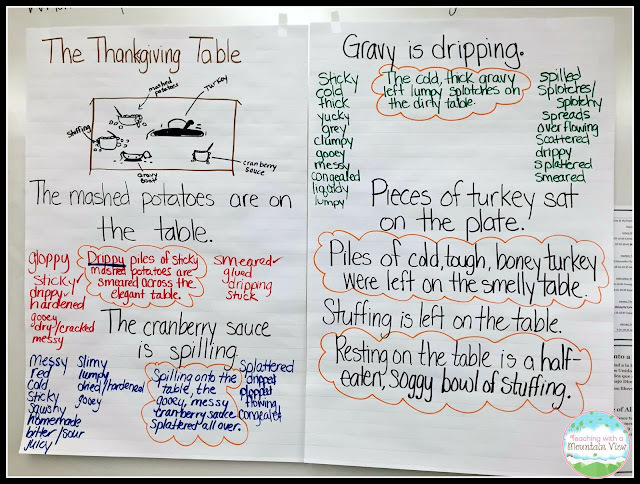 I'm popping in to share an always-popular Thanksgiving writing activity! This activity was inspired by my wonderful colleagues at Write Now Right Now, and the kids always ADORE it. You can do it before or after Thanksgiving! 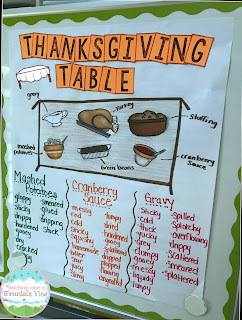 To start, I draw a picture of a table and I tell the kids to close their eyes and imagine their Thanksgiving table. There are a lot of smiles and sounds of "yumm!!" And then I tell them to imagine their Thanksgiving table...AFTER all the food has been eaten! 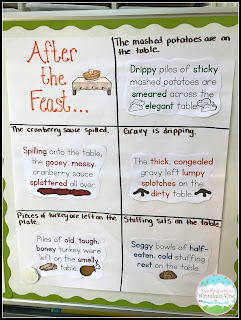 We talk about all the different foods that are on their table and how the "after" picture isn't nearly as pretty! I get pretty dramatic about this, drawing turkey bones laying next to the platter of turkey, cranberry sauce is spilling out of the bowl, mashed potato remnants are on the table, etc. It's not a pretty picture! Then, I ask them to tell me something to describe the picture. We write a REALLY HORRIBLY BORING sentence to describe what we are picturing. Then, we start brainstorming adjectives and verbs to spice up our writing! We brainstorm different ways to begin our sentences, and it's just a fabulous way to work on sentence fluency and word choice. Here is what the paper looked like when we did it together in class... I'm warning you, it's a totally non-Pinterest worthy chart! I almost misspelled Thanksgiving, I'm not sure if it's spelled 'boney' or 'bony,' and my drawings are that of a three-year-old, but my students love it nonetheless! I should have taken a picture of their version of the drawing because it was FAR superior! Here is a copy of the "final" version that we end up hanging in the classroom. I take a bit more time to make this one look nice and presentable! Finally, they add a topic sentence, transition words, and a conclusion sentence to complete the assignment. It is SO much fun, and I highly recommend it! 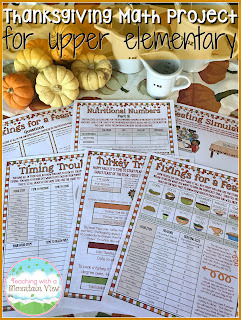 If you are looking for a fun math activity to go along with this, check out my popular math project, Thanksgiving Dinner Digits! 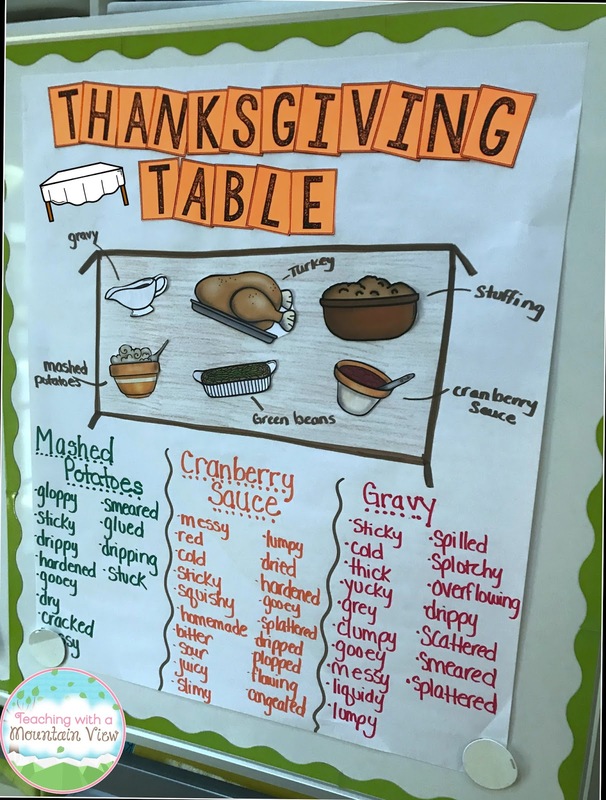 Kids love planning and executing their Thanksgiving dinner.